A collection of blogs about health, fitness, lifestyle and being a mum. 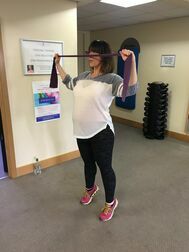 I was lucky enough to train Carys during her pregnancy and I am delighted that she has put together her thoughts on the training we did and how she thinks it has helped her recover after giving birth to her gorgeous son, Harry. "My road to pregnancy wasn’t plain sailing, as is the case with many women. Nature didn’t take its course quite as easily as my Husband in particular had thought! Isn’t that such a “man thing”? I had realised that having left it later in life to try for a family, it wouldn’t be easy. However, life led me to my soul mate, my Husband at a time that was right for both of us and that wasn’t in our twenties! Which is probably just as well, as we would have quite cheerfully murdered one another back then! My mindset was always “what will be, will be” and I’d rather be trying with the man I have chosen to spend the rest of my life with, than have made the decision to have a baby when perhaps my body was ready but my mind and emotions were most certainly not. We experienced miscarriage, we went through channels within the fertility clinic, we were then discharged after 4 months with the “professional” opinion that we had reached the end of this road and that we should consider private IVF. A somewhat distressing conversation took place whilst unbeknown to us we were already pregnant! So, with a little help our miracle baby boy is now just weeks away from arriving into the big wide world. Fitness has always been something both my Hubby and I enjoy and class as an important part of our lives. We like to look after ourselves through running, weight training and cross fit circuits. However, I feel we have a good balance of not being a slave to it and allowing ourselves to enjoy the things we love now and again but for the most part living a clean and active lifestyle. How was that going to change now I am carrying this precious new life inside me? It was important for me to continue with as much of a normal training routine as possible so I ran until mid-way through my 2nd trimester, when catching my breath was becoming harder and the pressure on my bladder increasing. I wanted to keep going but needed the reassurance that I was doing the right types of exercise for each stage of my pregnancy. Plus, my Hubby wasn’t comfortable with watching me throw weights around in our gym at home !I don’t have any medical conditions but having come down the road I have, I never forget how lucky I am to be carrying my baby. Being consultant led and it looking very likely they would deliver my baby boy via c section at 39 weeks, the right exercise programme was vital. It was important for me to maintain the level of the fitness I had built up prior to pregnancy and to ensure that my body and mind remained strong and positive to cope with surgery and life with my new baby. It was also important to try to make life as easy as possible on the other side and keep my recovery time to a minimum and get back into shape as quickly and safely as possible. Jacqui and I had known each other for some time, we met through local networking groups. I had supported her with getting her new PT business set up online and on social media. Having spent time with her it didn’t take long for me to fully understand her passion for inspiring and empowering women to take better care of themselves and in particular her passion for pre and post-natal fitness was infectious. 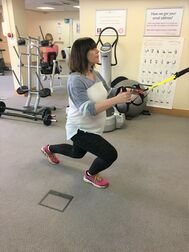 Once I felt I had reache‍‍‍d a point in my pregnancy where I needed some professional pre-natal fitness support, Jacqui was the person I turned to." As with all my new pre-natal clients, I fi‍‍‍rst started our journey by asking Carys to complete a detailed questionnaire to help identify any potential barriers to exercise during pregnancy. This combined with a good old chat over a cuppa enabled me to design a programme for her that would help prepare and strengthen her body for the later stages of pregnancy as well as post birth. 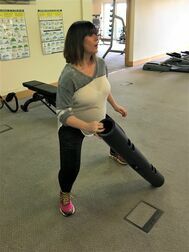 Carys’ training programme incorporated both body weight and resistance based exercises to help strengthen her back, glutes, legs, arms and core – all of which are essential for a new mummy. I also designed exercises that mimicked her upcoming movement patterns, i.e. pushing, pulling, bending, extending and rotating, whilst always ensuring both her and her unborn baby’s safety. 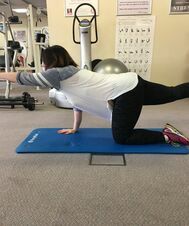 A key element of her training programme was establishing and regularly reinforcing a connection with her pelvic floor and her breathing. My aim was to instill this deep connection whilst she was still pregnant in order to help improve her recovery post birth. You can’t repair and strengthen your core muscles without first being able to consciously connect with them, including your pelvic floor. Carys’ training programme adapted over the weeks to take into account a growing baby bump as well as all the other physiological changes that happen. For more information on exercising during pregnancy, please check out my blog by clicking here. It was a real pleasure to train Carys. She always gave 110% and clearly understood the benefits that exercising during her pregnancy would give her. "On the 27th June 2017 at 10am our gorgeous baby boy Harry David was born via elected C section. ‍‍‍My birth plan indicated that I wanted the whole process to be as natural as possible. The whole procedure went perfectly as planned. We had our own playlist, we got to see baby delivered, my husband cut the cord. The cord cutting was delayed allowing baby to get the added benefits. The best thing was my time on the high dependency ward w‍‍‍as very short, my catheter was removed the same day and I was discharged the day after! I can’t stress enough how strongly I believe that this quick recovery following major surgery was down to keeping fit and healthy throughout my pregnancy." "For me there is no doubt that keeping up a good level of fitness through pregnancy really helps you post pregnancy. It’s also vital to work with someone fully qualified, like Jacqui to ensure the exercise you are doing is safe for you to do." If you would like more information on pre-natal exercise and how I can help, please get in touch.